It’s short – I encourage developers to go through it. Reviewers may save time by linking to it when testing anti-patterns pop up. Enjoy, I hope you’ll find it useful. I recently gave an internal talk about Neutron troubleshooting and wanted to share it with the world. Here’s the slide deck and video, enjoy! It’s time for OpenStack projects to take ownership of their quality. Introducing in-tree, whitebox multinode simulated integration testing. A lot of work went in over the last few months by a lot of people to make it happen. We plan on adding integration tests for many of the more evolved Neutron features over the coming months. OpenStack Tokyo summit voting is now open! I’m giving a lightning talk in the OpenStack Vancouver Neutron design summit. It’s a 5 minute talk about testing, common pitfalls and new developments with respect to testing frameworks. 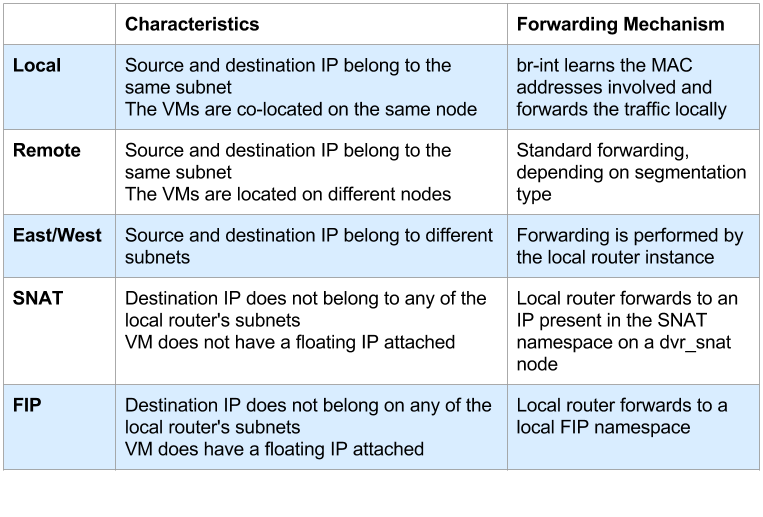 Legacy routers provide floating IPs connectivity by performing 1:1 NAT between the VM’s fixed IP and its floating IP inside the router namespace. Additionally, the L3 agent throws out a gratuitous ARP when it configures the floating IP on the router’s external device. This is done to advertise to the external network that the floating IP is reachable via the router’s external device’s MAC address. Floating IPs are configured as /32 prefixes on the router’s external device and so the router answers any ARP requests for these addresses. Legacy routers are of course scheduled only on a select subgroup of nodes known as network nodes. MAC addresses! Network engineers go to great lengths to minimize broadcast domains because networking devices have fairly modest upper bounds on their MAC tables. Most external networks use flat or VLAN networking: It is possible to subdivide them by using multiple external networks, or multiple subnets on a single external network, but let’s consider a single external network for the purpose of this discussion. With legacy routers you would ‘consume’ a MAC address on the external network per router. If we kept the existing model but distributed the routers, we would consume a MAC address for every (node, router) pair. This would quickly explode the size of the broadcast domain. Not good! IP addresses! Legacy routers configure a routable address on their external devices. It’s not wasted by any means because it is used for SNAT traffic. With DVR, as we noticed in the previous blog post, we do the same. Do we actually need a dedicated router IP per compute node then? No, not really. Not for FIP NAT purposes. You might want one for troubleshooting purposes, but it’s not needed for NAT. Instead, it was chosen to allocate a dedicated IP address for every (node, external network) pair. Every router on the compute node is hooked up to the FIP namespace via a veth pair (Quick reminder: A veth pair is a type of Linux networking device that is represented by a pair of devices. Whatever goes in on one end leaves via the other end. Each end of the pair may be configured with its own IP address. Veth pairs are often used to interconnect namespaces as each end of the pair may be put in a namespace of your choosing). As you’ve surely noticed, the rfp and fpr are configured with link local IP addresses. Every time a router is configured on a compute node and hooked up to the FIP namespace in case a floating IP was configured on said router, a pair of free IP addresses is allocated out of a large pool of 169.254.x.y. These allocations are then persisted locally on the node’s disk in case the agent or the node decide to do the unthinkable and reboot. Huzzah, a new source routing rule! This time it’s a specific rule with our VM’s fixed IP address. You’ll notice that it has a lower (Better) priority than the generic rules that follow. We’ll expand on this in a moment. If VM 10.0.0.4 (With floating IP 192.168.1.3) sends traffic destined to the outside world, it arrives in the local qrouter namespace and the ip rules are consulted just like in the SNAT example in the previous blog post. The main routing table doesn’t have a default route, and the ‘32768: from 10.0.0.4 lookup 16′ rule is matched. The routing table known as ’16’ has a single entry, a default route with 169.254.31.29 as the next hop. The qrouter iptables NAT rules apply and the source IP is replaced with 192.168.1.3. The message is then forwarded with 169.254.31.29’s MAC address via the rfp device, landing squarely in the FIP namespace using its ‘fpr’ device. The FIP namespace routing table has a default route, and the packet leaves through the ‘fg’ device. When the outside world wants to contact the VM’s floating IP, the FIP namespace will reply that 192.168.1.3 is available via the fg’s device MAC address (An awful lie, but a useful one… Such is the life of a proxy). The traffic will be forwarded to the machine, in through a NIC connected to br-ex and in to the FIP’s namespace ‘fg’ device. The FIP namespace will use its route to 192.168.1.3 and route it out its fpr veth device. The message will be received by the qrouter namespace: 192.168.1.3 is configured on its rfp device, its iptables rules will replace the packet’s destination IP with the VM’s fixed IP of 10.0.0.4 and off to the VM the message goes. To confuse this business even more, gratuitous ARPs are sent out just like with legacy routers. Here however, the floating IP is not actually configured on the ‘fg’ device. This is why it is configured temporarily right before the GARP is sent and removed right afterwards.